Just before Christmas, a kind and endlessly patient surgeon let me shadow him for a day. I followed him through hospital corridors, listened to him speak to patients about their operations, and watched him repair a broken hip. The twelve hours I spent with him not only gave me invaluable insight into the emotional landscape of contemporary surgery but also revealed to me things about my own emotional resilience and feelings about healthcare. We began the day with a morning trauma meeting, where x-rays of patients admitted overnight were shown to a range of healthcare professionals – including nurses, trainee surgeons and consultants – who then reported and reflected on the cases and debated the various treatment options. This was a teaching opportunity and more senior surgeons allowed trainees to make their own assessments and suggestions before gently correcting any misinterpretations. It was also an opportunity for those who had only just arrived in the hospital to learn about the patients they would encounter later that day. I was struck by how much consultants were told not just about the nature of the injuries, but also about the contexts in which the injuries occurred. Trainees presenting the cases provided biographical details, information about people’s homes, and the patients’ quirks, interests, and habits. The meeting was, therefore, not just a discussion of mechanical injury and impairment but also an introduction to patients’ experiences and internal worlds. It personalised depersonalised images of broken bones and coloured-in black and white pictures of suspended hips, wrists, and skulls with shades of individuality. Next, I ran around after my adopted surgeon while he carried out his ward rounds. I observed the rapid development of trust at the bedside. Surgeons and patients move from being complete strangers to developing an unusual intimacy (the type of intimacy that makes it okay to slice into another person with a scalpel) in a seven-minute consultation. This time-frame is not mandated by professional disinterest, but by the context of the modern NHS hospital. This context also dictated the high-speed at which we paced the corridors together. As an historian, my life is largely sedentary. I sit at my desk – or in an archive – and slowly turn the pages of a static document (digital or physical). I have never walked, ran, or stood so much in a single working day. Luckily, I had had the foresight to wear comfortable shoes. The frenetic pace and movement of the surgical day perhaps embodies the emotional risks undertaken by practitioners. Or, the physical exertion might distract you from the high emotional stakes of the hospital wards and the operating theatre. Perhaps this is a quasi-deliberate ploy (on the part of practitioners and institutions) to delay moments of reflection. It is maybe difficult to understand the emotional world of modern surgery without also appreciating the time constraints to which everyone within the hospital is subjected. On the one hand, limited time set aside for doctor-patient interaction might make detachment a necessity rather than a choice. On the other, the repeated instances where we were left waiting for an operation to start might foster frustration, boredom, and resentment. Much of what I experienced and observed caused me to further reflect on my own emotional responses to surgery and the hospital environment more broadly. I found the institution – clean and efficient as it was – claustrophobic, with an endless array of identically decorated wards, corridors, and stairwells that seemed almost deliberately disorientating. As a patient and visitor, my own experiences of being in hospitals – particularly the most recent ones – evoke memories of distress, suffering, and frustration. It was difficult to shake these negative associations, even when attending in a very different capacity. We spent the end of the day in the operating theatre – the bit that I had been most excited and apprehensive about. Anthropologists and historians – as well as several surgeons I have interviewed – have argued that one of the reasons why medical students are required to do anatomical dissections while they are training is to allow them to acclimatise to cutting through skin and, more cynically, to teach them to objectify the human body. 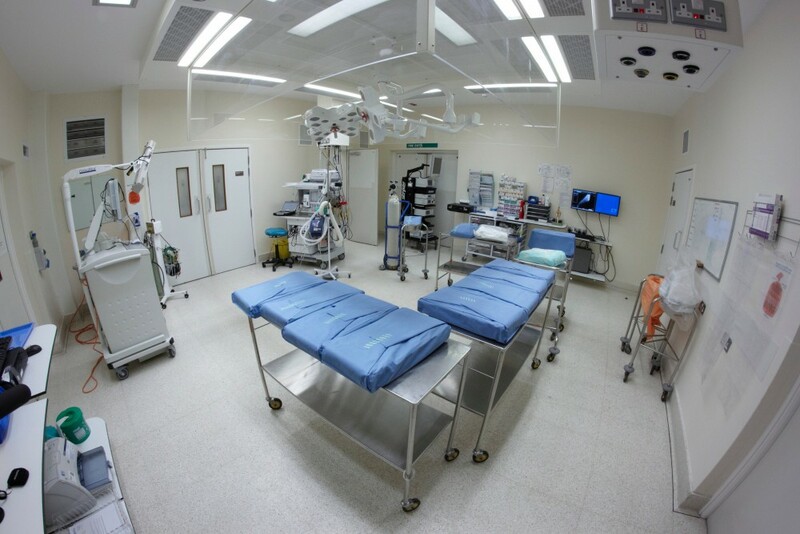 Not having gone through medical training myself, and even though I was supposed to be observing the emotional responses and experiences of surgeons, I was anxious about what the emotional impact of watching surgery might be on me. I’m not squeamish and have watched my fair share of medical dramas. Nonetheless, I thought I might find watching an operation distressing – worried that I’d be too acutely aware that the body on the table was a person. I watched three operations and the first, a hip repair, was unexpectedly physical. It involved heavy-duty machinery, tools, and equipment – and the patient had to be contorted into unnatural positions. But, the process of preparing the body for the first surgical cut erased any anxiety or distress. The patient is already anaesthetised, their body is draped, and the skin coated in a brown-yellow plastic film that renders it entirely un-skin-like in appearance. It was, therefore, very easy for me to focus only on the surgical detail and forget completely that under the green-blue drapes was a person with thoughts and feelings all of their own. It was difficult to tell whether this said more about processes of depersonalisation in contemporary surgery, or about me and my own tendency towards detachment. My surgeon for the day was an orthopaedic consultant – and perhaps the nature of that specialty means that the range of emotions experienced is different to that, say, that of a cardiothoracic surgeon or a practitioner who deals regularly with cancer. It seemed that the emotional landscape of surgery in this context was similar, in many ways, to a day in the life of a wide variety of working professionals. Surgeons, like many of us, experience the frustrations and tedium associated with working for a large, bureaucratic organisation; they, too, must navigate the emotional complexities inherent in teams and professional hierarchies; and they experience the stresses and strains of overwork. The one element that sets them apart from the rest of us – slicing into a human being – was maybe the least emotionally intense part of my day.